This blog is dedicated to continental Italian food—the kind of food you’ll find in Italy. But as long time readers will know, around this time of year we feature an Italian-American recipe. This year’s feature is a popular dish with a funny name: Shrimp Scampi. Funny to those who know Italian, that is. Since in Italian scampi refers to crustacean very similar to shrimp, the name basically means “Shrimp Shrimp”. Shrimp Scampi is a dish that brings back fond memories for me. We ate a version of this dish at home when I was a kid. I loved the tangy, garlicky sauce, and there was always plenty of it to soak up with crusty bread. Now that I’m grown up, I’ve tweaked the recipe to my liking, bringing it back a bit closer to its continental roots, but the basic taste remains the same as I remember. Anyway, Shrimp Scampi is a quick, easy and tasty dish to make. The main trick is to avoid overcooking the shrimp, which turns it hard and rubbery and destroys its delicate flavor. For that reason alone, it’s best to use the largest shrimp you can find. And the larger the shrimp, the more like actual scampi they’ll be (see Notes below). The dish will have better flavor if you use unpeeled shrimp and cook them with their the shells still on. But here in the US at least, that’s a recent “foodie” method of making the dish. Back in my childhood, the shrimp was cooked and served out of its shell. Less flavor, perhaps, but easier to gobble up, which is what we always did. Melt the butter in the olive oil in a skillet over low heat. Add the garlic (and peperoncino if using) and sauté gently until the garlic is just beginning to brown. Turn up the flame and add the shrimp. Toss for a minute or two, seasoning with salt and pepper as you go. Add the white wine. Let simmer for a few minutes more, until the shrimp turns pink and loses its translucence. The exact cooking time will depend on the size of the shrimp (see Notes below). Remove the shrimp to a serving dish. Add the lemon juice, parsley and freshly ground black pepper (and red pepper flakes if using) to the sauce remaining in the skillet and let simmer for another minute or so. Nap the shrimp with the sauce and serve immediately, topped with more parsley and a few red pepper flakes if you like, with lots of crusty bread on the side for dipping. As mentioned, the main thing to avoid is overcooking the shrimp. Shrimp is cooked as soon as it turns pink and loses its translucence. Total cooking times will vary according to the size of your shrimp. As a general rule of thumb, jumbo shrimp take about 7 to 8 minutes to cooking, large shrimp about 5 to 7 minutes, and medium sized shrimp only 3 to 4 minutes. For dish like Shrimp Scampi, where the shrimp undergoes two cooking processes, first a sauté and then a simmer, it can be a bit tricky to avoid overcooking them. Using larger shrimp and being fast on your feet should do the trick, but, just to be on the safe side, some recipes actually call for adding the shrimp at the end, after the wine is added to the soffritto and reduces. That isn’t very Italian—the initial sauté of the main ingredient in a soffritto is a fundamental technique in Italian cooking—but it might be a good precaution if your shrimp is on the small side. Or you can just remove the shrimp if you see they’re done before the sauce has had a chance to reduce properly. Then again, some versions of Shrimp Scampi call for transferring the shrimp to a baking dish, and topping them with breadcrumbs and grated cheese and passing it under a broiler to brown. Now that will virtually guarantee overcooking the shrimp. These days Shrimp Scampi is often served on top of linguini or another long pasta. I don’t remember that from back in the day and, quite frankly, the thought of a wine-y, lemony sauce with pasta isn’t very appealing to me at least. Plus, shrimp makes for a rather awkward topping for pasta. But if you like the idea, hey, to each their own. There are lots of variations on this dish. Some of them, like this one from Serious Eats, are pretty fancy and elaborate. To me, this is over-egging what, at the end of the day, should be a simple, homey, unpretentious dish. One variation that does appeal to me, however, is adding minced shallots to the soffritto, instead of or along with the garlic. I find it adds a pleasant, subtly sweet touch to the sauce that nicely balances the acidity of the wine and lemon juice. The main difference is that scampi have front claws that make them look a bit like miniature lobsters. As large as 24 cm (9 inches) long including their claws, they are bottom feeders, living at depths of between about 20 and 800m (65 and 2600 feet). Here’s a photo of the little beast. Scampi are eaten many ways—in risotti, fish soups, fritti misti or simply grilled, among others. Shrimp Scampi would appear to be an Americanized version of scampi in padella, or sautéed scampi. 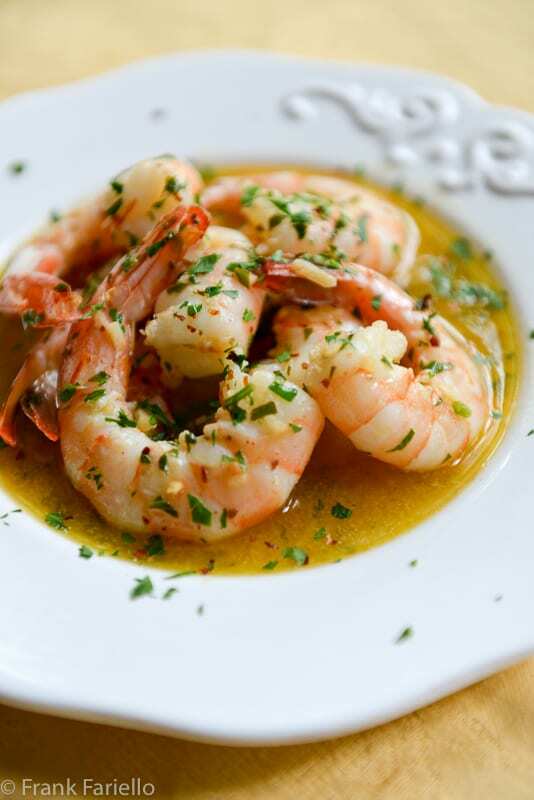 This online recipe comes pretty close to what we call Shrimp Scampi here in the US, although the differences illustrate how Italian-American cooking has departed from its Old World roots: the use of butter, as well as more of, well, everything, but most especially garlic. And while scampi in padella shouldn’t be dry, it isn’t brothy in the way many people prefer Shrimp Scampi to be. Add the white wine. Let simmer for just another few minutes more, until the shrimp turns pink and loses its translucence. The exact cooking time will depend on the size of the shrimp. Remove the shrimp to a serving dish. Add the lemon juice, parsley and freshly ground black pepper (and red pepper flakes if using) to the sauce remaining in the skillet and simmer for another minute or so. Total cooking times will vary according to the size of your shrimp. As a general rule of thumb, jumbo shrimp take about 7 to 8 minutes to cooking, large shrimp about 5 to 7 minutes, and medium sized shrimp only 3 to 4 minutes. Thanks for the kinds words, Cristina! PS: “Prouns”? Love it… ! That sounds like a regional pronunciation of “prawn”, common in the UK and other places to refer to shrimp, in particular large shrimp. After all you wouldn’t make this dish with tiny nordic shrimp! I made this the other night with my Argentine pink (or red) shrimp. It was very good. But I’d have to invite a very good friend who isn’t too hung up about manners to eat it with someone else, as I wound up picking them up and sucking the carapace, and of course was wearing an improvised “shrimp bib” (made from one of those free reusable shopping bags, one with handles long enough so as not to strangle me). There is a doctor here in Tucson that studies an enzyme that appears in garlic and not the other members of the allium family. He uses that enzyme to treat people with heart issues. Oddly, when I have garlic, my heart goes into tachycardia. They haven’t been able to confirm that it is this particular enzyme to which I am allergic, but the doctor seems to think it makes sense. Good to know that I am not the only one who makes this with shallots. I really do think the sweetness is wonderful! And, like you, the very risotto in our home pretty much starts with a shallot. I’ve always found it amusing to see “shrimp scampi” listed on menus – like a double take on the same thing – but not really. Indeed, as you point out, the scampi in Italy are not the same as what we call shrimp here. Your version has me wishing I could have either for dinner tonight. But I do not like having to deshell the messy shrimp at the table. Very understandable, Linda. I can go either way, so long as they’re big enough to peel easily, I’m OK. The terminology really is confusing since it varies so much between countries. In Sweden, “scampi” would refer to the kind of shrimp (or is it “prawn”?) native to tropical climates, that is often used in Southeast Asian cuisine. We often also call them “giant shrimp” or “tiger shrimp”. The kind you are referring to is called “sea crayfish” in Sweden. Just “shrimp” would be interpreted as the small Nordic kind, found in the northern Atlantic Ocean. Not sure, Olof, since I’m not familiar with Swedish terminology… 😉 but that it sounds about right. I think crayfish, at least the ones here in the US, are a bit bigger than scampi. As you say, it’s all very confusing! Olof, I think people in at least some parts of the US use the term crayfish (or crawfish) to refer to a freshwater variety, usually larger. We also have tiny Nordic shrimp here in Québec, at the other edge of the northern Atlantic Ocean. Delicious and nutritious, but too small for this recipe. I made a salad of them with lime juice and garlic mayonnaise for a party last night, and will eat the rest on good rye bread. These would be “sea crayfish” (langoustines in French). I absolutely love this dish. I used to do it in the oven – until the olive oil created flashes of fire! I love the idea of two quick sautés. Will definitely be making this – fresh shrimp arrives from the gulf next week! Thank you so much, awesome work! And thanks for your comment, guys! Hope you like it if you do try it! qui abbiamo la fortuna di poterli mangiare appena pescati, la costa istriana è famosa per una ricetta che si chiama “Scampi alla buzara” , la conosci ? Mai provata ma ne ho sentito parlare. Sembra simile a questo piatto, solo che nel sughetto c’è il pomodoro, vero? Each Thursday I would go to dinner at a local Italian (American) restaurant with my grandmother and order Shrimp Scampi, such memories. Honestly, is wasn’t until much later that I understood the translation and that this was an east coast speciality. Never the less, it is a dish that is delicious when prepared correctly as you have described. It is a great dish, Paula. I’m not always keen on Italian-American dishes, to be honest, but this one’s a winner. I love shrimp scampi and your recipe w the garlic AND shallots sounds the best! Curious as you point out the redundancy in the name roughly translating to shrimp shrimp. Language is interesting! Could it be shrimp cooked in the style of scampi? That brings to mind the typically southern USA dish, chicken fried steak, which then begat chicken fried chicken! But, what’s in a name as long as it is as delicious as is shrimp scampi! In any case, never having put shallots in my shrimp scampi, I’m going to give that a try – for tonight’s dinner. Your recipes motivate me, Frank. Thanks! PS on my earlier post: I prefer my shrimp to be shelled when served in the scampi. Frank, would you render your opinion on reserving the shells and simmering them in the wine prior to adding the strained wine to to shrimp? Hmmm… I guess the idea must be that it adds back the taste you lose by shelling the shrimp. Since I haven’t tried that technique, I wouldn’t want to pass any definitive judgments, but at first blush, I’d say it sounds like more trouble than it is probably worth. But again, worth a try. What gorgeous photographs! That shrimp looks so incredibly delicious. I really loved all the info in your post, thank you! Yes, langoustines here in Montréal. Frank – and readers – recently we’ve been getting Argentinean pink shrimp – they are already pink when raw (those I have in the freezer are raw with the shells, which I prefer). I was thinking of making a paella with them, but I think I’d prefer your recipe as it would be easier to avoid overcooking them and everyone enjoys mopping them up (fare scarpetta) with good crusty bread. The only shrimp that are remotely local here are the tiny nordic shrimp, which are delicious but so small that they don’t really bear any recooking; better in salads. Those Argentine shrimp sounds nice… will have to look for them around here. Some of the ones I’ve had came (frozen) from this company: https://www.facebook.com/mdrfoods I don’t know if they are processed in the Californian Marina del Rey or if they just liked the name. I’ve also bought them, also frozen, with no specific brand, at a Portuguese shop nearby that has dependable frozen seafood. I’d certainly love to taste them, ideally fresh, in their own environment, but then I dream of going to Argentina to see how Italian culture has evolved at the other end of the Americas (and for the good wine…). I haven’t had this dish in ages! And it’s a good one. I’m OK with serving it on pasta, but I agree it’s better all by itself. With bread, of course, to dip up the sauce. Really nice — thanks. I am constantly confused by the different crustaceans in different countries! The UK, Italy and the US, to be specific, all have different terms for these guys and similar crustaceans. I don’t think we actually have some of the choices that are available in Europe and so that just confounds things further. Yep, it is all very confusing! And do enjoy the event, I’m sure it’ll be fabulous. Nice recipe Frank. Truelly I don`t have Scampis or Gamberi really often in my kitchen, because it`s difficult for me to get good qualitiy for payable price. But when I get them I cook it exactly like you, from the first time I had preapered Scampis. The only thing I do differant, is yousing a frutty olive oil instead of butter. And yes Scampis don`t need fancy recipes, keep it simple is best! You’re so right, Danny. Thanks for stopping by! Every once in a while, I get out my family’s Italian-American recipes (spaghetti AND meatballs, for the most egregious example) and it takes me back to languorous summers on the lake shore in Vermont with all those who have now passed on. I suppose it is akin to visiting the cemetery, right? You are very lucky that you can eat shallots! Many people allergic to garlic are also allergic to all the alliums: the onion/garlic family. I like shallots too, and they are easy to find here in Montréal as they are prominent in French cuisine. I’ll use both making this dish. Food memories are powerful, David. And, of course, this whole blog named after my grandmother is really all about those memories. On the garlic: Interesting that you’re allergic to garlic but not other alliums… I didn’t know that was possible, but of course I’m not a doctor, lol! Anyway, that’s lucky. I agreed, this dish is wonderful with shallots. In fact, if I remember correctly, that’s the way my mom used to make it. And I really love shallots in general. Often use them instead of onions in dishes, especially in risotto. As you say, they add a lovely sweetness. This is exactly the way I love this dish. I remember hearing the term Shrimp Scampi — I was learning English and I asked my parents. They were just as confused as I was. Shrimp Shrimp didn’t make sense. I believe nowadays they tack on the word scampi to describe the way the dish is prepared. And the hot pepper flakes is an absolute must for me!! Buon weekend, Frank! Thanks for stopping by, Paola! 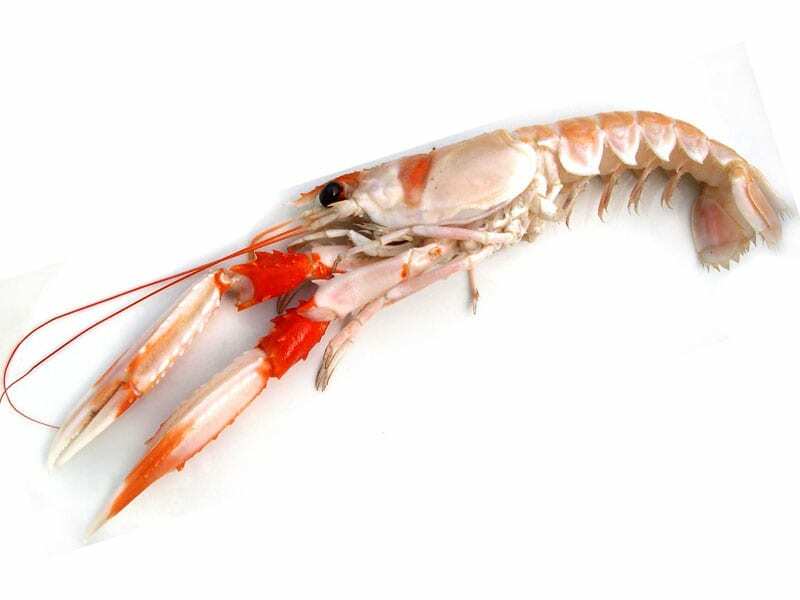 PS – here in the UK we believe these crustaceans are called by their French name – Langoustines. Or even Dublin Bay Prawns. They have the claws out in front like mini lobsters. Thanks so much, Martha! Love the story about Shrimp Scampi, and happy I could clear things up for you. 🙂 You’re right, I really should feature more pickles. Although I do have one for giardiniera, Italian cuisine abounds in sott’aceto recipes. That green tomato recipe sounds fantastic. I would love this recipe exactly because the sauce is simple, that’s the best way to enjoy them and without covering their taste. And interesting the description: every time I ordered something outside Italy with the name Scampi it always arrived in front of me dishes containing shrimps, and I was always disappointed because I prefer scampi personally to shrimps (but I like both) 😀 so I never understood if they used the 2 words randomly as synonyms or if they used it on purpose 😀 but now if I understand well you use the word scampi to refer to a specific way to prepare shrimps?